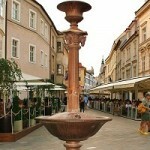 On this audio point, you are standing at the junction of streets Michalska, Laurinska and Panska, next to the simple iron fountain. Its name is the Bird fountain because a lot of birds used to come and drink from the upper water reservoir. In fact, it is not a masterpiece nor historic monument but we can use it as a good stop for the interesting buildings in its surroundings. From the cathedral, you will go down the stairs and turn left to the Panska street. A first junction is our audio point.